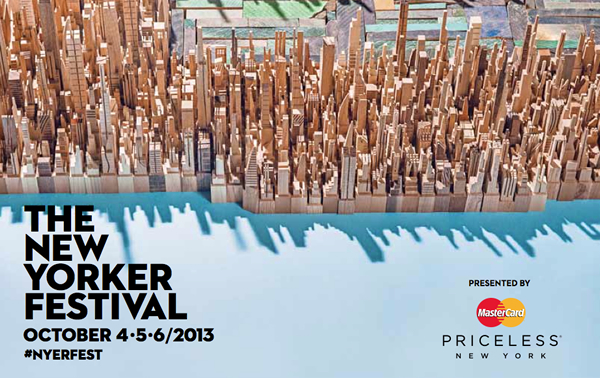 The schedule for the 2013 New Yorker Festival is here and as usual, the lineup is rife with literary luminaries such as Jonathan Franzen, Jonathan Lethem, Michael Chabon, Zadie Smith, Junot Diaz, Colm Tóibín and many other NY Festival favorites. IMHO, some of the more interesting shows on the docket this year include: Apollo Robbins talks with Adam Green, Brad Paisley talks with Kelefa Sanneh, Marina Abramovic talks with Judith Thurman, Michael Shannon talks with Burkhard Bilger, First-person Filmmaking with Miranda July, Improv Everywhere with Rachel Dratch, An Evening with Funny or Die hosted by Billy Eichner, High Spirits with Simon Coughlin and Jim McEwan (Master Scotch Distillers), The Fermentation Project with David Chang, and Television and Politics with W. Kamau Bell Armando Iannucci, Michelle King, Robert King and Shonda Rhimes, Christoph Waltz with Susan Orlean, “Buried Alive” with Aziz Ansari, and Foodies Unite in the garden of Roberta’s. An advance screening of the new Netflix special by Aziz Ansari, followed by a conversation between Ansari and Andy Borowitz. With Miranda July, Alex Karpovsky, Kenneth Lonergan, and Terence Nance. Is Technology Good for Culture? Karl Kraus, media criticism, and the digital age. With Jonathan Franzen and Clay Shirky. With Heidi Cullen, Piet Dircke, Klaus Jacob, and Jerrold Nadler. With Katherine Boo, Raffi Khatchadourian, George Packer, and Sarah Stillman. With Antonio J. Mendez, Jeffrey Moss, Stella Rimington, and Joseph Weisberg. With Rachel Dratch, Christopher Guest, Aubrey Plaza, and Horatio Sanz. Join the team at Funny or Die for an evening of sketches, new comedy videos, and surprises. Hosted by Billy Eichner. Simon Coughlin and Jim McEwan, of the Scottish distillery Bruichladdich, will conduct a tasting of rare whiskies and discuss their craft with Kelefa Sanneh. With World Famous *BOB*, James Tigger! Ferguson, Murray Hill, and Dirty Martini. Peter Schjeldahl will lead his fifth annual tour of the museum before public hours begin, followed by coffee and conversation. Over brunch, Betty Halbreich will talk with Lena Dunham and Judith Thurman about her decades-long career as a personal shopper. Join a live version of The New Yorker’s Cartoon Caption Contest, hosted by Robert Mankoff. Matthew Diffee, Carolita Johnson, and Liam Francis Walsh will judge the results. Calvin Trillin will lead his thirteenth annual walk from Greenwich Village to Chinatown, stopping at his favorite eateries along the way. Ian Frazier will lead a bus tour of his Staten Island haunts, culminating with a late lunch at Enoteca Maria. Dave Arnold, Amanda Cohen, Ariane Daguin, and Sean Rembold will talk with Dana Goodyear about the rise of American food culture over a collaboratively prepared lunch in the garden of Roberta’s. David Chang will lead a workshop and tasting of fermented foods and talk about his food empire with Larissa MacFarquhar. The event will include a three-course meal and Milk Bar desserts. Join Tavi Gevinson and the writers and editors of the online magazine Rookie for music, ice cream, and a reader talent show. Ages thirteen and older. With Brian Greene, Joseph Incandela, Lawrence M. Krauss, and Lisa Randall. With W. Kamau Bell, Armando Iannucci, Michelle King, Robert King, and Shonda Rhimes. Moderated by Emily Nussbaum. The U.S. première of the new film drama, starring Judi Dench and Steve Coogan. Afterward, the director, Stephen Frears, will talk with David Denby. The world première of a new documentary about the classic children’s novel. After the film, Adam Gopnik will talk with the book’s author, Norton Juster, and illustrator, Jules Feiffer.